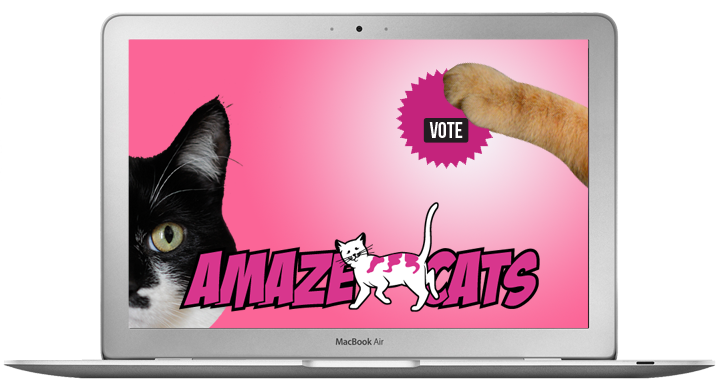 There's just a few short hours left to vote for AmazeCats Next Top Cat! So pretty-please help me and my kitty friends make it into the top 32! You don't even have to choose, because you can vote for ALL of us! It's really fast...just a couple clicks. It's so easy, Waffles Too could do it! These are some top kitties! YES! These are our fave kitties too! They all get our vote! I just voted again. I thought it was a one time only vote on this. I am so very sorry. Woo-Hoo!!!! We voted again! Good Luck Katie and efurrybody! We have VOTED! Good luck, everyone! I've been voting for everyone like mad! Last time I counted, it looked like we all were gonna make it into the bracket - paws crossed that we continue to do well on the last day! Hope all went well with incoming intruders. Have a fabulous Furday. Good luck to all our furiends (and thanks for making the voting so easy, Katie)! Voted for you and your friends. Good luck. Yay, it looks like all of us made it to round one! Thanks for including my Odin. We have been voting for all of you, every single day! And it looks like you all made it to round one! YAY! We couldn't make up our collective minds, so Mom voted for them all! Kattie! Wowwie! Yous is the bestest! Good luck but I don't understand why Pope Keisha isn't on there. I'm the most popular cat there is. we voted! good luck to everybuddy!